A couple of people asked for the recipe for the Welsh cakes I posted yesterday. Add the sugar, spice and fruit and mix them in. Add a drop of milk to bind the mixture together into a soft dough. Roll out the dough until it is about half and inch (1 cm) thick. Cut into circles with a pastry cutter. Cook on a griddle or heavy frying pan until done, flipping occasionally to ensure even cooking. Eat hot or cold with butter. In texture they are more like a scone than a biscuit (British not American) and not as hard or chewy as a cookie. Many thanks! Im going to try these today. You could try them with cinnamon instead if you can't get mixed spice. They are lovely on their own or with butter but better with butter and jam (jelly to the US) Or even with cream and jam, but it's rare we go to that length. It looks like the stores in the US don't sell Mixed Spice, but it was suggested that I could try using Pumpkin Spice as a substitute. It's a similar ingredients list -- mostly allspice and cinnamon -- so I'll pick up some of that when I next go to the store. Pumpkin Spice sounds absolutely fine. Mixed Spice is just our generic spice blend and it's only purpose is to add a little more flavour to the Welsh cake. As caridwen says, cinnamon on its own would also work just fine. Thanks for recipe. When I saw the photo earlier I wondered if they were like currant scones. I might give these a try; I like scones. Welsh cakes are not unlike scones. The recipe is very similar, though we normally make scones thicker and bake them in the oven rather than cooking them on a griddle. That was the perfect little sweet treat with a cup of tea. I used dried cranberries and a bit of cinnamon. 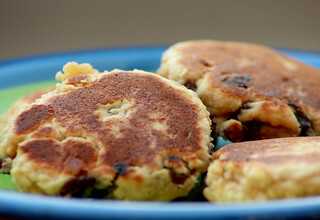 I love welsh cakes but can I make them without sugar? The only problem with leaving out the sugar is that you are basically left with shortcrust pastry. If you use Splenda or similar, you could put that in as a sweetener instead. Otherwise you could try them without sugar. The advantage of baking them on a griddle is that you can do very small batches without having to heat a whole oven. You could halve the quantities (ie 2 oz flour and 1 oz butter/margarine) and make 3 or 4 Welsh cakes just to see whether they're OK without sugar.